ALBAOLA MUSEUM Languages: English, Spanish, Basque and French Timetable: From Tuesday to Sunday .Closed on Mondays except festivity days , 16/09-14/06 : 10.00 -14.00pm 15.00-18.00 pm 15/06-15/09: and Easter Week 10.00-14.00pm 15.00-19.00 pm Closed : Christimas 24-25-31/12 and 1-6/01. Meeting Point: Albaola Museum Calle Ondartxo 1 Pasai San Pedro. IN ALBAOLA WE ARE MAKING HISTORY In Albaola we are making history and you can see it. In the spectacular enclave that is Pasai San Pedro, 3km away from San Sebastian, ALBAOLA THE SEA FACTORY OF THE BASQUES is a museum-shipyard where we are building a scientifically exact replica of the San Juan whaling ship from the XVI Century, before the public. The original whaling ship was built in this same port of Pasaia and sank off the coast of Canada in 1565. The remains were found in 1978 and the Canadian government undertook a research process which lasted three decades. 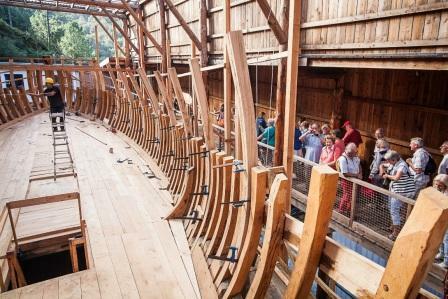 Based on the information gathered, the construction of this 28-metre-long whaling ship, is unique in the world. The ship is being built with XVI century techniques and has UNESCO sponsorship. How to get here You can get here in different ways: on public transport, by car, by boat or on foot. BY BUS. In the city centre of San Sebastian, you can get the E09 bus on Okendo street (in front of the Maria Cristina Hotel) and get off at the last bus stop, in Pasai San Pedro. A 10 minute walk along the bay will bring you to the Albaola museum-shipyard. (Link BUS Okendo street: https://goo.gl/U9yfwa) BY CAR. From San Sebastian, take the G-20 towards Irun or take exit 5 on the A68 motorway Bilbao-Behobia. Where to park: During the week: You can park for free at the muelle de San Pedro car park (P1: link car park: https://goo.gl/i5zZEs) and at the muelle del hospitalillo car park (P2: link car park: https://goo.gl/PM5aUX). On the weekend: You can park for free at the muelle del hospitalillo* car park (P2: link car park: https://goo.gl/PM5aUX) (this is also where you can get the boat). BY BOAT For those who wish to complement their visit with a boat ride, you can do so by booking the boat service which will take you from the port to the museum. The booking must be done beforehand with the Itsaszerbi service. (We recommend this option especially for the weekends) During the summer months you can come from the port in San Sebastian to Albaola on the Ciudad San Sebastian Catamaran. ON FOOT, A NATURE WALK: A different way would be to come on foot from San Sebastian. You can hike along the coastal path San Sebastian-Ulia-Albaola. This path is also suitable for families. It runs alongside a spectacular section of the coast from San Sebastian to Pasaia and ends in Albaola. Here's the link for a map which also highlights interesting spots along the way: https://goo.gl/Mo7ANh A map showing how to come to Albaola, the Sea Factory of the Basques. Albaola, the Sea Factory of the Basques, a live museum Once you've got here, you can visit our three spaces: The museum: Here we put into context the history of the San Juan whaling ship with an exhibition: characteristics of the ship, the sinking and research, traditional Basque shipbuilding, the materials used, the relationship between Basques and indigenous tribes, and so on. Amongst other things, you can see a scientific model of the whaling ship and a scientific replica of the whaling txalupa, also found in Red Bay, the oldest in the world. 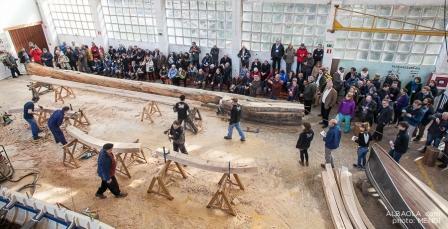 Theatre of the sea: This is where the naval carpenters of Albaola work on the different pieces of the San Juan. They do so in front of an audience, using XVI century techniques and procedures. Each tree is a piece, each piece is a piece of craftwork. This occupation of the naval carpenter is recovered and brought to life here. Traditional shipyard: Here you can see the process of the building of the San Juan whaling ship. In this great big wooden shelter, each visit affords you the chance to see a different step of the building process. Each visit is unique and different. 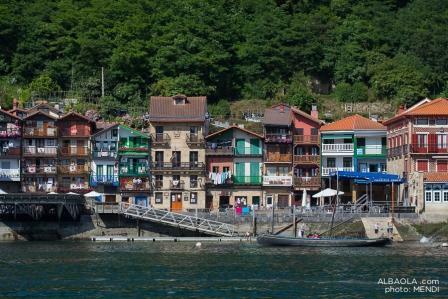 Albaola has become one of the Basque Country's most visited cultural enterprises. It is also a first-class reference point in the world of maritime culture and traditional shipbuilding worldwide. A visit to the Sea Factory of the Basques can be done in four languages [Basque-Spanish-French-English] and is suitable for anyone. There are special materials and panels for children to enjoy their visit and all the spaces have been adapted for those with limited mobility. Different options to learn and have fun Albaola offers different options aimed towards different groups, children, the elderly and families, for example. These can be craft workshops for children or gastronomy packs for those who wish to get to know the local gastronomy. Spend the day in Pasaia: historic port, culture and gastronomy As well as visiting Albaola, in Pasaia you can enjoy beautiful views. A walk through the streets of Pasajes San Juan recalls the rich fishing and maritime history present in every corner of this historic town. It is also known for the many restaurants which offer local dishes. There are other places of cultural interest, such as the Victor Hugo house, where the famous French writer, author of Les Miserables, lived and wrote about Pasaia. Price (Tax Included): Adults 7.00€, Young peole ( 7-17 years old) and Retired People 5.00€, Chilren until 6 years old free Duration: 1 hour At Albaola the Sea Factory of the Basques in Pasaia we are building a historical replical of the San Juan, a whaleship built in this very port in the 16th century. You can see it right before your eyes. 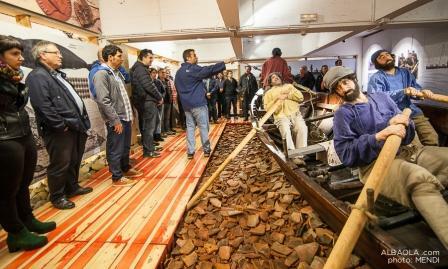 In this shipyard converted into a museum, you will travel through Basque seafaring history and observe the carpenters' craftsmanship first hand, and if you like you can arrive by boat. Besides, this proyect has the recognition of UNESCO.